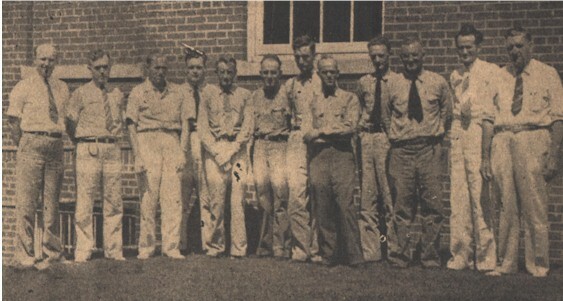 In 1929, DuPont sent employees from the Technical Department of the Engineering Division to perform an in depth study of the condition of the village to determine what improvements could be made. The study presents a "wish list" of items that the group felt necessary for the village to reach top quality. Over the years, many of the suggestions were completed, but many were not. This report is long, so this web page only contains the business piece of the report. You will find other pieces of the report in various places on this website. In Old Hickory there are two centers of business activities. The principal one is it the intersection of Cumberland and Donelson Avenue. The other is on Hadley Avenue at Twelfth Street. The former is adjacent to the two-story apartment area and at the main entrance to the village; consequently, and for reasons previously stated it should be as attractive in appearance as possible. Unfortunately the present conditions do not meet these requirements. The buildings are all relics of the war-time era and while some improvements have been made, both to the buildings and surroundings, the area still has a temporary; makeshift appearance. It is recommended that all of these be replaced by buildings or a permanent substantial type of a design in keeping with the southern atmosphere and local tradition. Old Hickory is named after President Andrew Jackson whose home is within a few miles of the village. This home, "The Hermitage", is a beautiful old southern mansion and it would be fitting that this type of architecture be carried out in the new buildings as has been done in the public building. These building should be grouped around the triangle formed by Bryan Street, Cumberland and Donelson Avenues and on Donelson Avenue east of the triangle. The triangle itself should have no buildings but should be an open area appropriately landscaped. In designing the new buildings, space should be provided for all of the above mentioned activities except the Doctor's Offices. These have recently been moved to a new building on Hadley Avenue at Twelfth Street. In addition to these, space should be provided for village Administration Offices and Offices for the local newspaper force. This is the area in which the post office currently stands. It was the business district at Cumberland and Donelson Avenue. 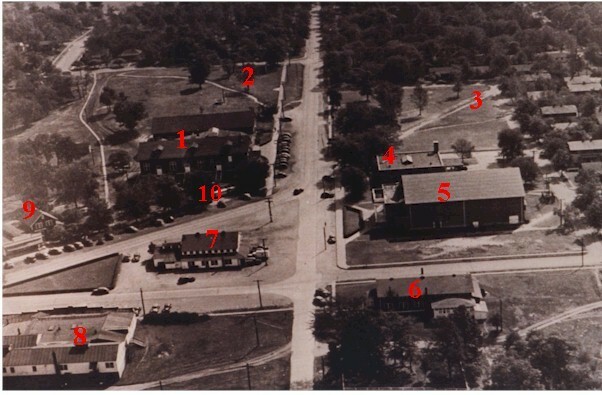 Note that the only buildings remaining in 2002 are the post office (#4) and the Rhodes Building (#9). Buildings that have been added include the current fire hall (#2), a new community center (in place of #1), and the shopping center (#3). Each number has a hot spot that will take you to information about the building when it is clicked. The "Y" building constructed in the powder plant era, served various recreational needs of employees for over 40 years. The club included a gym, bowling alley, billiards room, soda fountain and barber shop. The gym was used in the 1920s for showing silent films, but soon after the advent of "talkies" in 1928 the movies were transferred to the Old Hickory theater which was equipped with sound. Like many buildings in Old Hickory, the club's appearance improved dramatically over the years. To the right are two photos that exemplify these improvements. To maintain proper morale among worker, diversion must be provided for the idle hours between work and sleep. This is especially true of young unmarried workers of whom there are many in Old Hickory. Some effort has been put forth along this line attended with fair success. These activities will be enumerated and suggestions made for improvement. The community club which has previously been mentioned caters to a large percentage of the male workers and to a limited extent to the girls. The pool tables and bowling alleys are very popular, especially during the colder months. The large lobby and porch afford a good loafing place, which is very necessary in this community as many men and boys board and most boarding places do not provide inviting nor comfortable quarters for these off hours. The soda fountain with its distribution of ice cream, candy and tobacco, etc. is a necessary adjunct to the Lobby. All of these recreational features are good for the employees and should be continued, and in addition they are a source of revenue to the Company. While all of this is true the whole outfit can and should be improved. The pool tables and bowling alleys are in poor condition much of the time. 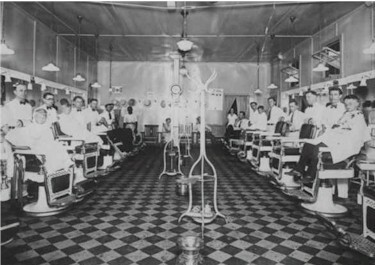 This photo is of the barber shop which was inside the club. 3. Where shopping center built in 1948 now stands (2002). The present Post Office is an old frame building which was originally a part of the war-time school house. There has been some intimation that the Federal Government will erect a Post Office building here before long. If this improvement is made, the Government may be induced to work with us and design the new Post Office to harmonize with the type of architecture it is decided to use. In fact, it might be possible to have this building designed as a monument to President Jackson in which case we should by all means improve our portion of the area in keeping therewith. On the site where Sullivan's Department store now stands was opened the first office, in Feb. 1918. At the very beginning it was a small affair and poorly manned and it was catalogued as the fourth class. The Nashville office furnished the one here with one hundred dollars worth of stamps and one money order book. The allotment for clerks was so far below what was needed that there wasn't any hope of meeting requirements. 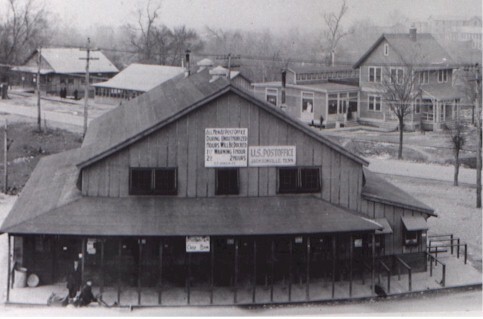 Within a very short time the post office was moved across the street where it occupied half of the Robinson Grocery Store. It is told on J.W. Williams, postmaster then, that he hired forty clerks and paid them out of his own pocket until he could get his quota increased. Then he had to work through Representative Joe Byrns to regain the money he had spent. Separate windows were opened in the building, one for nearly every letter in the alphabet, to facilitate distribution of letters. The volume was so large that a night shift was put on, but even then the long lines of waiting men and women after the arrival of mail each day from Nashville was similar to the lines at the bank on paydays. In April of 1935, a new modern brick building was erected with Works Progress Administration funds and Old Hickory's post office went to its permanent location. This was a $60,000 job and gave the village a beautiful as well as an up-to-date place for postal service. Post Office 1918 - The sign reads "All Men at Post Office during unauthorized hours will be docked 1st warning - 1 hour; 2nd warning - 2 hours." 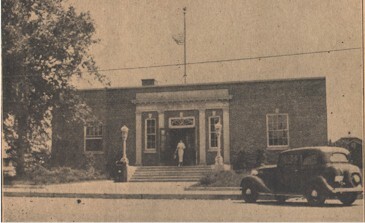 Today's post office as it appeared in 1939. Postal Workers 1939: Left to Right: N.T. Warren, Thomas Jacobs, R.B. Sands, Charles Ensley, C.V. Lineweaver, T.R. Ritchison, Ivan Matthews, R.C. Woodard, L.E. Sweeney, T.E. Chumney, B.W. Carson, assistant postmaster, and D.H. Ensley, postmaster. 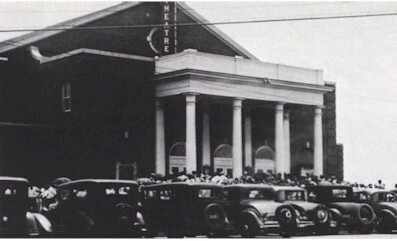 Often playing to overflow audiences like the one at the right, the Old Hickory Theater was a favorite entertainment center for thousands of employees and families. The theater was operated by DuPont from 1931 until it was sold to the Crescent Amusement Company in 1948. It offered the top movies of the day and, according to Ray Foster, manager, the most popular films were those with Shirley Temple, Bob Hope, Bing Crosby, Will Rogers and would you believe Frankenstein ("three people fainted in a single showing of Frankenstein one day," recalled Foster.) Prevalent prices were 10 cents for children, 20 cents for adults in matinees and 30 cents for adults in the evening. During on brief period in 1932 when large numbers of employees were laid off, movies were shown free of charge. A short time ago the officials of the Nashville Trust Company, of which the bank in Old Hickory is a branch, approached the local management of the Old Hickory Plant with the proposition that the Trust Company erect a new bank building better adapted to their needs than the present building, and of course of better appearance. 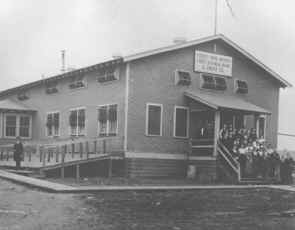 They were informed that it was the Company's policy at Old Hickory to permit no building by private interests but there was a possibility that in the not far distant future the Company would provide better business buildings. This further illustrates not only the desirability but the necessity of these proposed improvements. The Robinsons had several businesses in this area, but the central business was the store situated on the triangle. 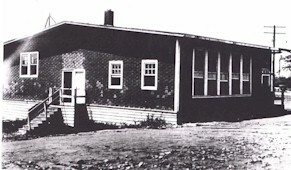 The store doubled as a bus stop and post office prior to the 1930s. As one might naturally expect, the Old Hickory business section has grown larger with the development of the community. Whereas fifteen years ago, Old Hickory had only a handful of business houses, today upwards to a hundred different enterprises serve this community in various capacities and with various lines of merchandise. 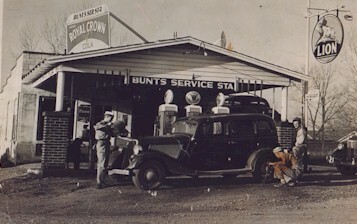 Included in this list are ten service stations, several tire dealers, one exclusive auto accessory store: four drug stores, more than a dozen food stores; four new and used car dealers; four cleaning establishments; four furniture dealers; six restaurants and eating places; two motion picture houses; three coal dealers; one ice plant; one water concern; five barber shops; a bakery; newspaper office and job printing plant; one department store; five other dry goods merchandising establishments; one exclusive jewelry store; two shoe repair shops; a flower shop; home laundry; two hotels, one girl's dormitory and men's hostelry; hardware store;; five , ten and twenty-five cent store; tailoring shop; Doctor's building in Old Hickory proper with two dentists, five physicians and a public health department, a doctor's clinic and a dentists office in Dupontonia; two chiropractors; two lawyers, two undertaking firms and perhaps other business and professional establishments which do not come to mind at this time of this writing. And so one might consider on the face of the above report Old Hickory as a very "well-rounded" community with respect to the number and diversity of its business houses. On the other hand, the general layout of the town makes Old Hickory a most unusual business town. In contrast with most other towns of its size and potentiality there is really no definitely outlined business center. Indeed there are really four different and distinct business centers, all of which are dependent upon the one community for their trade. In the section known as the Uptown business section there is a drug store, theatre, bank, department store, filling station, shoe shop, flower shop, cleaning shop, recreation center, and restaurant. However, about a quarter of a mile away is another business section comprising two large chain grocery stores, drug store and large ready-to-wear, dry goods store. Here the Doctor's Building is also to be found. About a half a mile farther on out on the main highway is the Dupontonia shopping center with thirty-two different retail enterprises, including furniture shops, department stores, dry good stores, restaurants, barber shops, jewelry store, baker, food stores, automobile dealers, hotel, and newspaper and job printing plant, filling station, lawyers office, coal yard, dry cleaning establishments, chiropractor's office and motion picture theatre. There is also a coal yard and ice manufacturing plant located on Bryan Street in Old Hickory proper. Old Hickory firms are well equipped to handle many of the needs of this growing community. Several local stores rank high among the stores of the entire county in total annual sales. Prospective customers may expect to find here merchandise of a high quality, attractively priced. In years passed, local merchants have banded their efforts in trade-at-home movements which have proved successful. A service peculiar to this particular community, is the custom many of the stores have of cashing du Pont checks. Since du Pont employees are paid off exclusively by checks this proves a great convenience to the customer and is also advertising value to the merchant.